Dennis was a Pit Bull who was neglected and left for dead on a bridge. A passerby found him and called Hope For Paws. Infested with ticks and barely able to move, he was quickly rushed to the hospital where he was given a blood transfusion and seen by a host of specialists. After 5 intense days and various treatments his organs started to shut down. His body couldn’t handle all of the stress and sadly he passed away. 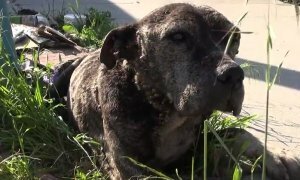 This video reminds us of how precious life is and how much needs to be done to help save more animals from neglect and abuse.